There are many common sense items that go along with safety when you’re jumping on an in-ground trampoline. If you’re new to in-ground trampoline ownership, though we want to pass along this series of in-ground trampoline safety tips for both children and adults. 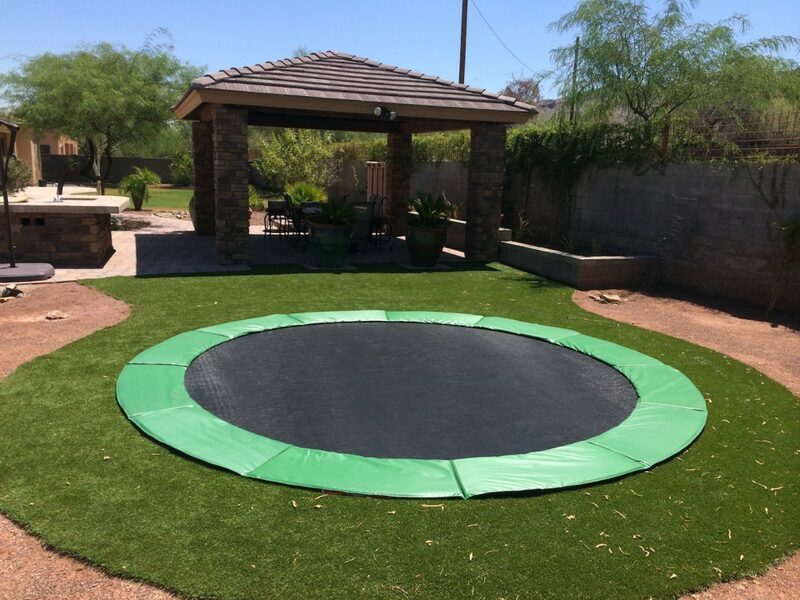 Place the in-ground trampoline so it is not near any overhanging roof, eaves, trees or fences. Children will be children and some may get to jumping higher than you’d like them to and if that happens you don’t want them to injure themselves by hitting their heads. Keep the in-ground trampoline away from branches and roofs. If your in-ground trampoline is by trees, make certain there are no low hanging branches that could cause injury. Before anyone gets on the in-ground trampoline perform a quick inspection of the mat and the springs to assure they are both in good shape. Make sure there are no rips or tears on the jump mat and that the springs are all secure and none of them are damaged or rusted or that they have come loose. Always have a safety pad in place to cover all of the springs and hooks that hold the jump mat secure on your in-ground trampoline. Check these every time to assure they are secure and in good condition. If you’re going to have a safety net for your in-ground trampoline make sure it’s of high quality and that it is securely in place. Make certain your children know not to jump and grab onto the safety net – it is there to keep them from falling and injuring themselves. Safe jump heights need to be monitored even with an in-ground trampoline. When you’re rebounding you are many, many feet off the ground and if you’re too high and if you don’t land back on the jump mat you can certainly fall and injure yourself. A fall from an in-ground trampoline won’t likely be as bad as one from an above ground trampoline, but make certain the kids are jumping safely and landing safely. What rules do you have in place to keep your children and other family members safe when they’re rebounding on the in-ground trampoline?